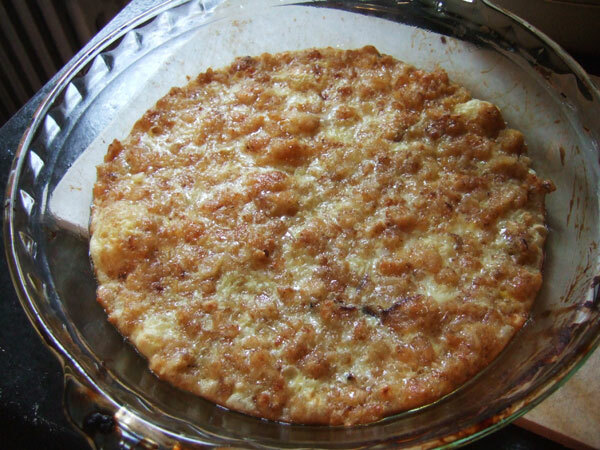 Apple pie with a matzo meal crust. Back in September, I was asked to represent the Lower East Side Tenement Museum at Apple Day. Apple Day pays tribute history of the Lower East Side, which in the 1700s was part of Mr. Delancy’s farm and included a sizable apple orchard. My assignment was to feature apple dishes that reflected the neighborhood’s immigrant history. I was immediately put in mind of a cookbook I’ve talked about before: Ba’ṭam’ṭe Yidishe maykholim; or, Tempting Kosher Dishes. The book is now online thanks to the Steven Spielberg digital Yiddish library. Ba’ṭam’ṭe Yidishe maykholim is a perfect example of Americanization and assimilation through the dinner table. Released by the Manischewitz company in 1944, the slender cookbook is written in both Yiddish and English and features Kosher for Passover recipes for classic American dishes like Boston Cream Pie. Someday soon, I will cook many more recipes from the book. 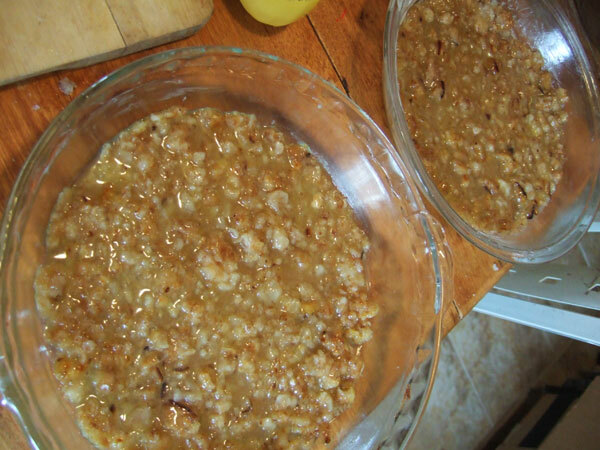 But on the morning of Apple Day, I decided to tackle Matzo Meal Pie Crust. This recipe starts wierd and gets weirder. I put my matzos in a bowl and covered them with water until they got squishy; then, with my hands, I tried to squeeze out as much water was possible. The result was a pile of moosh. Why I had to do this, I’m not sure, because the next step is to dry the matzos back out. I toasted the matzos in a skillet. The recipe requested I use “fat” which means “schmaltz” which means “chicken fat,” which sadly I didn’t have. So I used a tablespoon of Crisco instead. Crisco is also kosher and released their own bi-lingual cookbook. 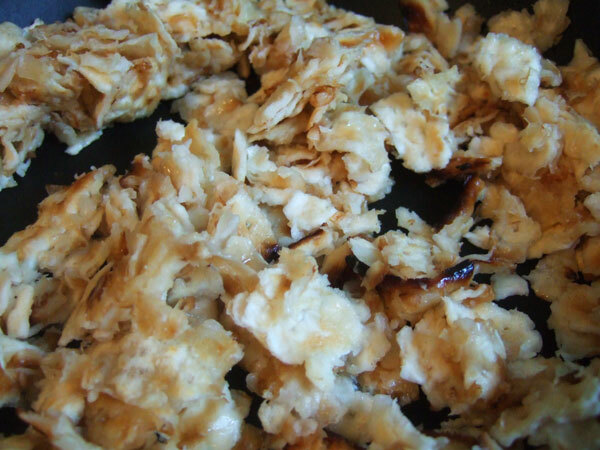 Matzos wet, then dried again, in a skillet with Crisco. The next step in the recipe is where things took a turn for the worse. I mixed the toasted matzo crumbles with all the other ingredients which turned it back into moosh. Really runny moosh. There was no way I could “press it into a pie plate with hands” because it was just liquid. A mess. It occurred to me I was using large eggs and perhaps medium eggs were a more appropriate size. So I decided to scrap my messy disaster and start all over, from the top, with new matzos soaked in water. I made you puke pie. The second time around I used one egg instead of two and it was still a runny, goopy mess. Usually, when something I make looks that much like puke, I call it quits. But the fact of the matter was I had to be at Apple Day in about two hours. So I poured my goop into two pie plates and slide it in the oven to pre-bake it before the filling went in. I put it in at 350 degrees for about 20 minutes. In the meantime, I prepared a basic apple filling. When I took the crust out of the oven, it looked better, but still suspect. It had, a least, formed into something crust-like. 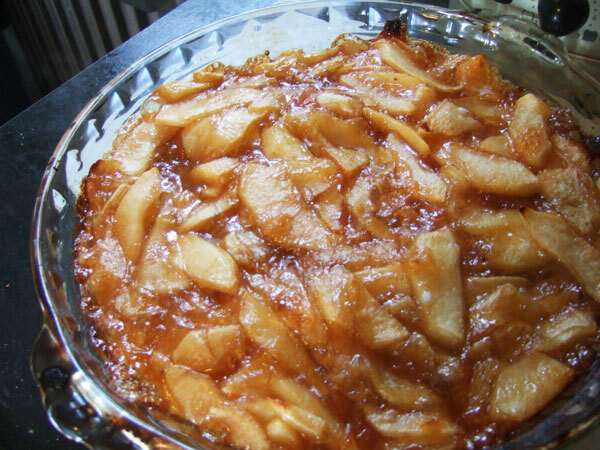 I poured in the apple filling and put it back in the oven for another 15 minutes. This time, when it came out, it looked rather glamorous. I wrapped it up and carted it off to Apple Day. In the end, this crust was a real surprise. At the event, I cut the pie and scooped out a serving to taste test. The crust was almost meringue-like: sweet and crunchy, but a little chewy, too. Like apple pie over macaroon cookies. Really, really good. To be honest, I’d make this crust again, although I’d try to figure out if I could cut out some of the mush to dry to mush to dry steps. It was a real shocker that something that looked so much like a throw-up could end up tasting so delicious. You are a caution Sarah! When making something weird the first time, well I might have given up. CHeers to your intrepid spirit. Don’t you ever wonder if someone ever tried a recipe before putting it in a book? Or if they tell you its a family favorite and it is inedible, you wonder what their family didn’t like? I remember seeing war-time recipes for things like cracker crust pie… wonder if this is related??? I have heard of a ritz cracker pie from the WWII era. it’s a sort of mock apple pie. I’m going to get recipe and give it a try; it’s supposed to be pretty good! I was looking at this, Did you use Matzo Meal, or did you crumble up whole Matzo crackers? Cause it looks like it calls for matzo meal which would be diffrent. oh no I miss read that, it uses the whole crackers too. yea that’s weird. try powdering the crackers first in the foodprocessor first and you’ll get a much better and more serviceable dough. I wonder, do you think the yiddish version of the recipe works better?